My wife and I were celebrating our sixth anniversary. I remember a good but not great concert. Went with a bunch of college friends from BGSU. We were on the floor. I remember all these guys having to carry their girlfriends out to the hall because it seemed like they were about to pass out from the heat. I had to get to the hallway, too. I started getting dizzy, but made it out to the hallway and sat down for a spell. What a dump that Toledo Sports Arena was. I was centre, maybe 25 foot from the stage. I can remember being unimpressed with Donovan, don't know why maybe I was expecting more. I haven't tracked down a recording of the concert, the nearest I have found was the next one which was at Wembley, England. As for the heat, it had been hot and humid all summer, so I must have been getting use to it by then. According to the Wikipedia entry for "Our Song" (90125), this is the Toledo gig referred to in the lyrics. Donavan opened. 1st show on the tour. It was a sweat box. Opened with Roundabout. I thought that was great cause the previous two year it was the encore. Not all the stage setup was there. Band commented on that. Played every song off going for the one except going for the one. The encore started with a video of a man slowly runing toward the audience. He kept getting larger and larger. I figured going for the one but they played Starship Trooper. Great Show. Lots of sweat. 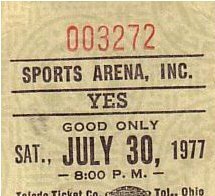 I am wondering if there is anyone out there that remembers the 1977 (I think that was the year) Toledo, Ohio concert when the AC went out and the entire place turned into a sweat bath. The floor was water, papers were stuck together, everyone, including the band members, looked like they had just gotten out of the swimming pool and Steve had a horrible time keeping his guitars tuned. 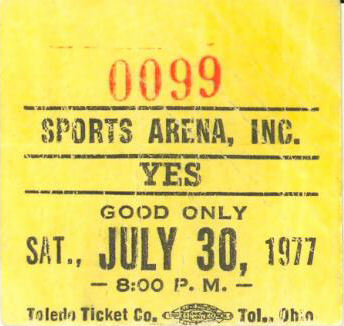 The most amazing thing was the perseverance of YES as they kept playing, trying to give us their best. And the fans joined in not caring at all of the quality of sound or performance or any of the critic jargon, everyone was, well at least the bunch I was with, were happy just to be with our YES family. It turned out to be a concert never to forget. Anyone else remember that one??? I was standing front and center about fifteen feet from the stage. It was a brutally hot and humid night, as I recall, and Steve appeared to have trouble keeping his guitars tuned. The floor of the arena was actually damp from the humidity. When the band came back [after 'Awaken'], Jon asked the crowd what they wanted to hear. I shouted out "South Side of the Sky." He looked down toward me (and many other people of course) and said, "Who said that?" Then the band played 'Starship Trooper'. Oh, well.